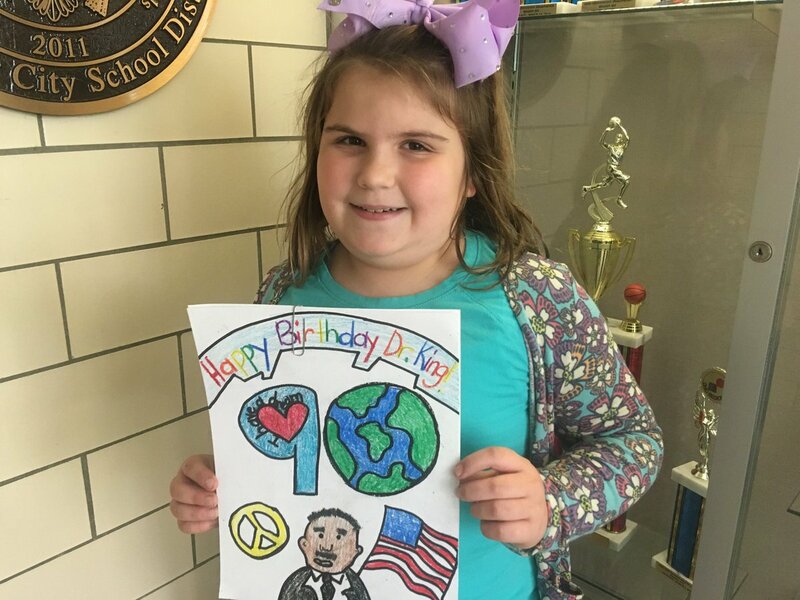 Kensington 4th Grader Wins "Happy Birthday, Dr. King Contest"
ROCKY RIVER, Ohio - Congratulations to Kensington Intermediate School Grade 4 student Evelyn who was named the Grade 4 winner in the Happy Birthday Dr. King Holiday Scholarship Contest! The contest celebrates the life, work and legacy of Dr. Martin Luther King, Jr., in honor of the 90th anniversary of his birth. Students in Grades 1-12 were invited to create a birthday card for Dr. King, using the title "Happy Birthday, Dr. King!". Evelyn was named the Grade 4 winner and will be honored at the 19th Annual Dr. Martin Luther King, Jr. Holiday Breakfast Celebration, which is scheduled for Monday, January 21, 2019. During the Celebration, Evelyn will be introduced to the Community along with all other winners, and each student will receive a scholarship and other prizes.